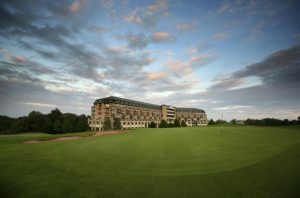 When you think of golfing holidays, the first locations that spring to mind are probably the Algarve in Portugal or maybe even Florida in the USA, but why not Wales? The popular holiday destinations of Porthmadog and Pwllheli in North Wales are not only home to some great coastlines and tourist hotspots, you can also enjoy a round or two of golf here. If you are a golfing enthusiast and need somewhere to play and stay, either with a group of friends or as part of a family holiday, then these towns are perfectly positioned for cottage holidays. The two towns are approximately 14 miles apart, so if you want week-long cottage getaways, you could play both courses several times. There are many golf courses that have beautiful scenery, but the Welshpool Golf Club is in a league of its own. It has many natural undulations, and the designers have clearly made great use of the original terrain. The current 18 hole golf course at Llandrindod Wells opened in 1907, and not much has changed in its style or design since then. One fairly unique feature of this particular golf course is that there are no sand bunkers. The 18th hole is thought to be the piece de resistance of this remarkable course. Opening in 1895, as a 9 hole golf course, only becoming an 18 hole course in the 1970’s, Cardigan Golf Course is a gem with not to be missed amazing views. Located in New Quay and Aberaeron, it is popular with tourists who love cottage holiday getaways. The area is great for families, and even non-golfers are sure to have a great time here. Low key golf course, Rolls of Monmouth, has something for everyone including on-site holiday cottages for the most die-hard golfers to enjoy. Each hole has its own challenges and the old Rolls Mansion backdrops both the 9th and 18th holes.